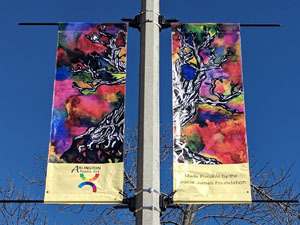 Arts Arlington 2019 Youth Banners have arrived! Home > News > 2019 Youth Banners have arrived! 2019 Youth Banners have arrived! The newest crop of banners from our 2018 Youth Banner Project have just been hung by DPW on light poles along Mass Ave in Arlington Center. The theme this year is TREES, and each of the 20 images celebrates trees in many different ways, including photography and painting. The banners will up for several months. To learn more about the Youth Banner Project, click here.